On this Friday, January 6th, 2017, our blog post topic is Epiphany Three Kings Day Christmas Magi Stamp. And we are remembering “The Gift of the Magi” short story by O. Henry. If you have been wondering why your neighbor still has their Christmas lights up, it is probably because they are waiting for today – the 12th day of Christmas – is Epiphany. Image above of the Three Kings Day Christmas Magi Limited Edition Forever stamps from 2014. If you haven’t gotten around to ever reading the short story by O. Henry here is a link to The Gift Of The Magi. And if you have read it, go ahead and get a hot cup of chocolate, tea, or coffee and enjoy reading it again! Thank you for joining me today for Epiphany Three Kings Day Christmas Magi Stamp. And my sincere Thank you to my dear friend who emailed me earlier this week about today truly being the 12th day of Christmas suggesting today’s blog Title! 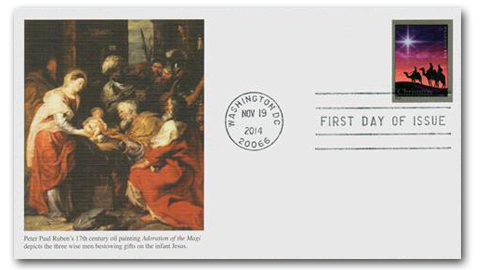 Christmas Magi Stamps Celebrate Visitors Bearing Gifts November 19, 2014. US Postal Service, Postal News. – Excerpt. Epiphany in the United States – Excerpt. Wikipedia Epiphany (holiday) – Excerpt. O. Henry, The Gift of the Magi – Quote Excerpt.